Northampton Town have transfer-listed midfielders John-Joe O'Toole and Chris Hackett, while fellow first-team regulars Matt Duke and Lee Collins head a list of nine released players. Ben Tozer, Darren Carter, Ross Perry, Lewis Hornby, Ian Morris, Billy Bodin and Tom Newey complete the departures. The club have not yet decided whether to offer keeper Shwan Jalal a new deal. O'Toole, 26, came on a three-year deal in June from Bristol Rovers, after scoring 15 League Two goals last term. 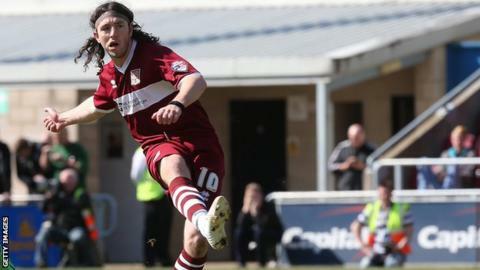 "It's just not worked with John-Joe," Cobblers manager Chris Wilder told BBC Radio Northampton. "Sometimes you have to hold your hands up and cut your losses. "There were lots of takers for him in the summer, but he's never recaptured the form he had at Bristol Rovers." O'Toole had a brief loan spell at Southend United this season, but made just two appearances. He is now looking for his seventh different club. The Cobblers, who finished 12th in League Two, 10 points adrift of the play-offs, now have just 12 first-team players under contract. "We're going down the younger route," said Wilder. "We've got enough experience in the squad. It's difficult inheriting someone else's squad, but now we feel there's an exciting period ahead. "It's a tough part of the job for any manager but we have to make professional decisions to take the club forward. "Shwan Jalal remains a possibility. We've not made a decision and we'll see where we are later in the summer. We've got a budget to work with."